Spent the weekend working on the downstairs apartment. The dining room had ceiling tiles, the 12"x12" type, but they were badly water damaged, and we took them down quite a while ago. Got half of them up, then moved to other things. I finally finished the other half. Also mostly finished is the living room floor. I used cheap laminate. It looks as good as the better laminate I used in other rooms, but doesn't assemble as easily. 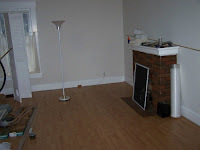 It looks better than the worn-out carpet we had before, and tons better than the painted floor underneath. I still have to put trim down, but that should be fairly easy. Nice and bland (but easy care) for renters.